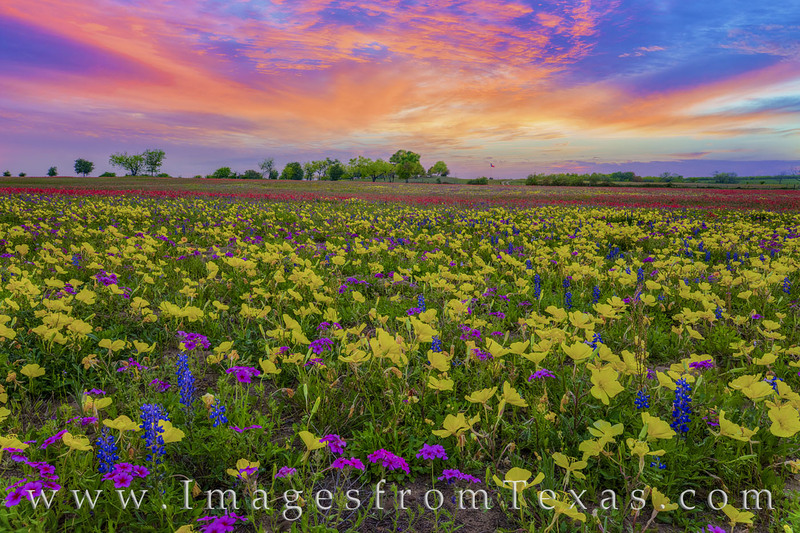 A sea of color seemed to stretch to the horizon in this wildflower photograph from New Berlin, Texas. I hadn’t visited or photographed this area in several years, mostly because the wildflower bloom had been disappointing. However, I was invited down from my home in the hill country by a land owner, saying the field was the best he’d seen in many years. So I made the trek down and enjoyed this marvelous sight for an evening. The sky offered fleeting yet amazing color overhead as wildflowers of several varieties, including bluebonnets, phlox, groundsel, coreopsis, paintbrush, and Missouri primrose filled this pasture. I spent an hour shooting this scene, and each direction I turned offered another amazing view. Photo © copyright by Rob Greebon.